Things are looking up at the studio, the red panels of faux-brick apartment buildings replaced with planks of soft blue sky and wispy clouds. 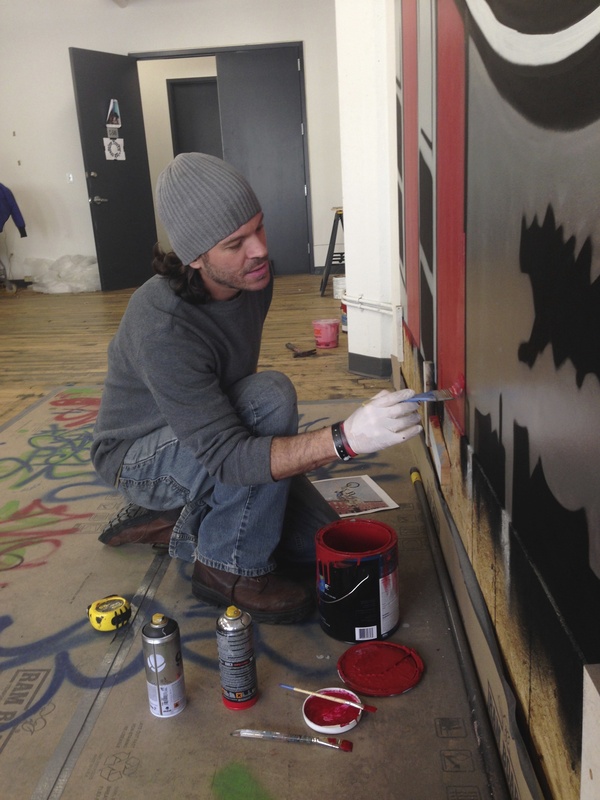 At Cre8tiveYouTH*ink’s temporary headquarters at Industry City in Brooklyn, the mural production is progressing quickly, and it was time for some reflection on the “Sign Language” project, its origins, and its impact on the arts apprentices. 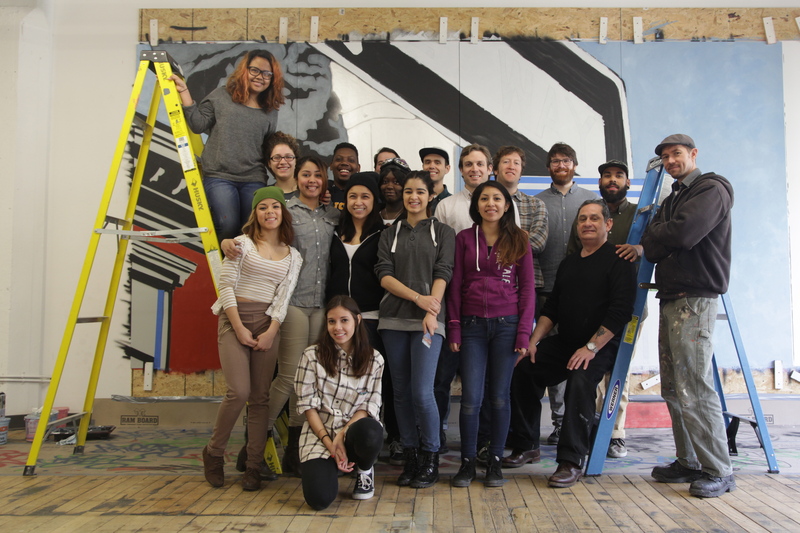 The Cre8tive YouTH*ink crew with the developers of 267 Pacific Street. On a brisk Sunday, the developers of the mural’s eventual home at 267 Pacific Street – The Quinlan Development Group and Lonicera Partners – stopped by the studio to check out progress on the mural. Tim Quinlan, the development group’s senior partner, spoke about his hope for this project. 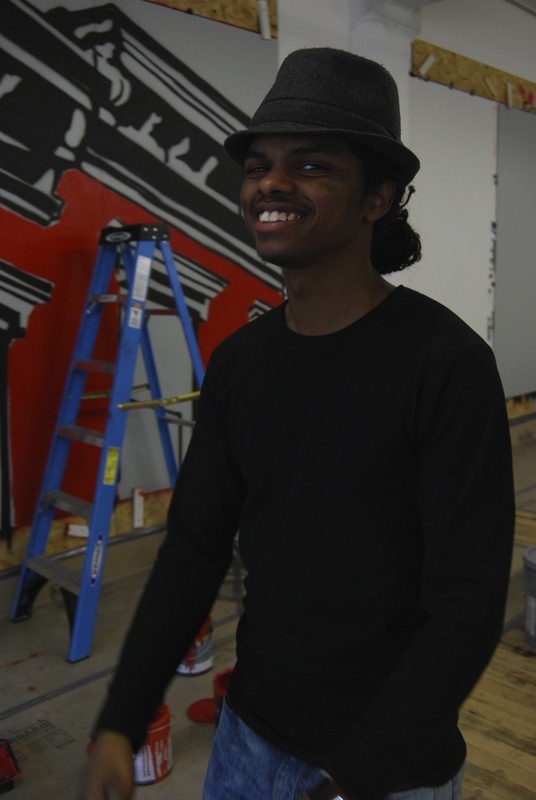 While he humbly understates the tremendous influence he and his group have had in making the project happen, he makes clear his desire to “support the next generation of artists,” stating numerous times that he is very gratified to be providing the youths with the opportunity to participate in the building’s construction while developing new artistic skills. And indeed the project has helped the apprentices develop as artists by inspiring new ideas and learning new techniques for their own work outside of this project. For some of the apprentices, the use of stencils and spray paint was a first, and has been a tremendous learning experience. “I can’t remember when I used stencils before, not how we do here. ” said Virginia, the youngest apprentice in the project. 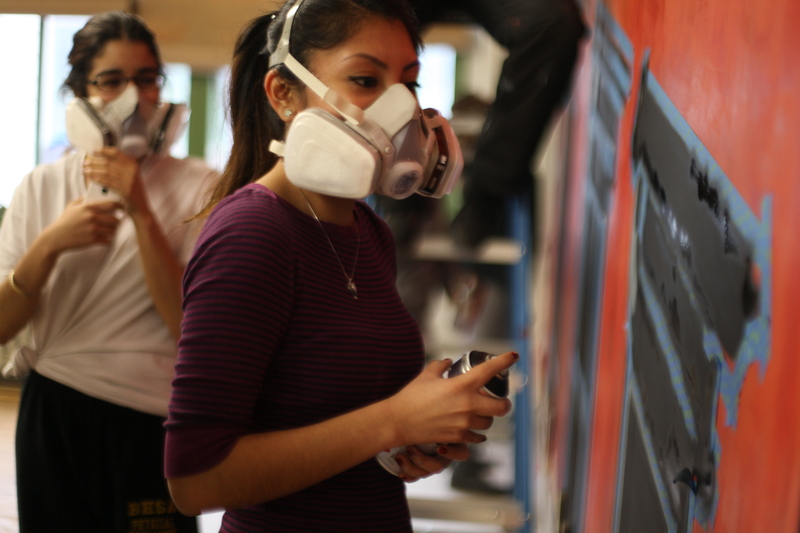 Similarly, some of the apprentices were exposed to spray paint in a new light by the project. 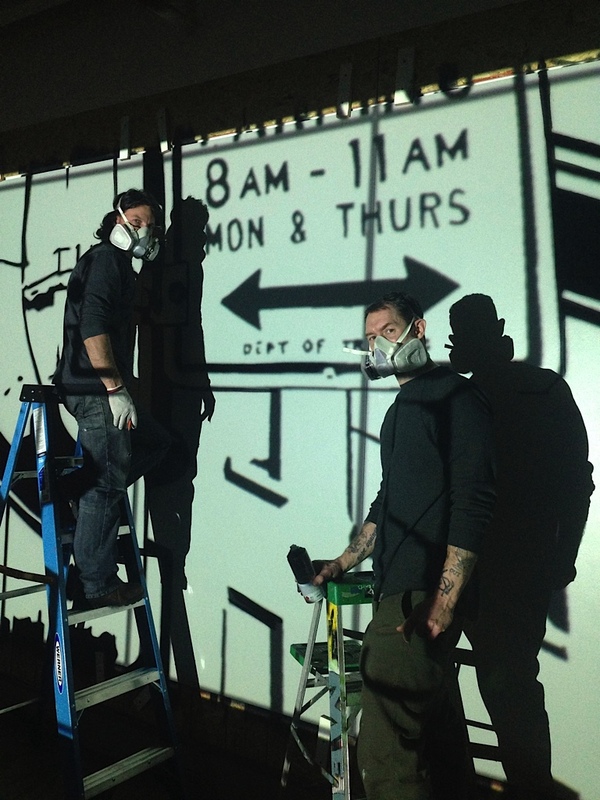 The legitimacy of aerosol-based street art was stressed and reinforced as a mode of expression by the project’s teaching artists Billy Mode and Chris Stain. For those who had previously worked with stencils and spray paint, the sheer size of the mural taught them not to think small when it comes to their own art. 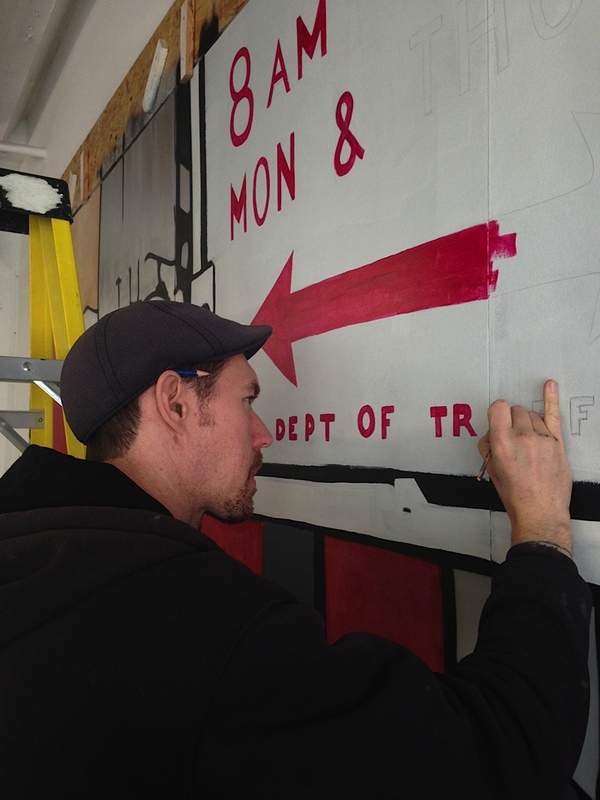 Tim Quinlan also spoke about the origins of the idea of the mural’s production, which, came to him while walking down Smith Street with John Evans (another partner in the project) and realizing they had a “80 foot blank concrete wall” visible from the streets of Downtown Brooklyn. 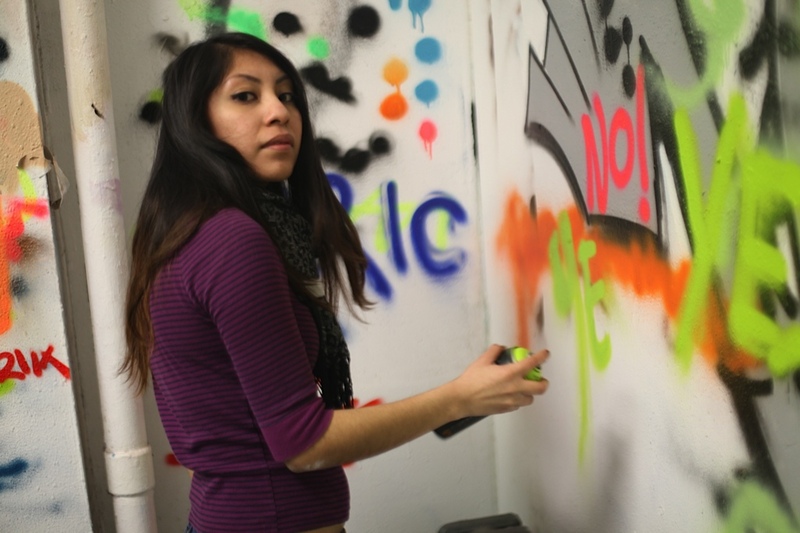 Their search ultimately led them to Cre8tive YouTH*ink, a non-profit creative arts youth development organization. 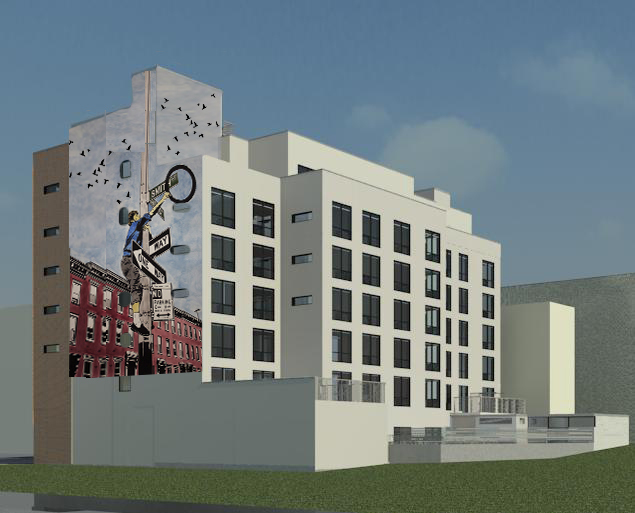 The mutually beneficial relationship between the two groups was immediately obvious; and that’s how the building at 267 Pacific Street gets to have a beautiful mural which will become a part of the neighborhood’s visual landscape, and the Art School Without Walls team members get to cut their teeth and develop a new set of valuable skills by working on such a large-scale project. 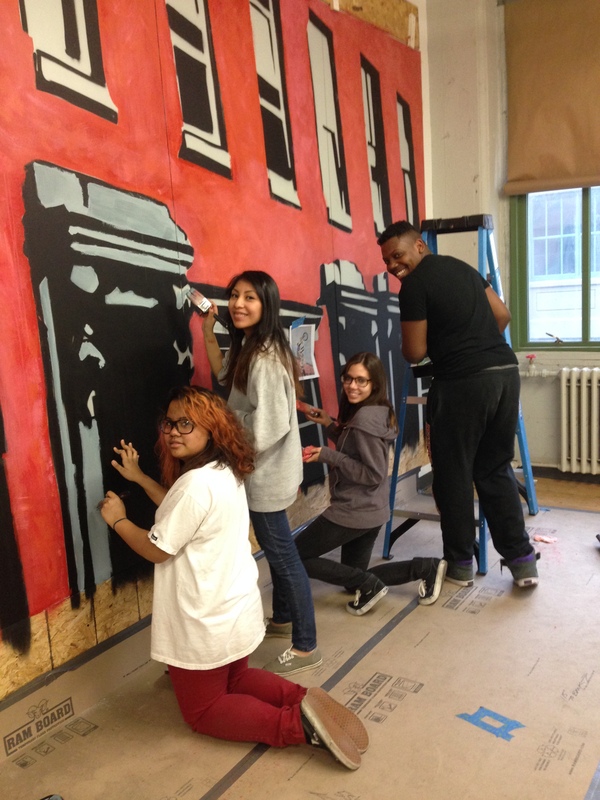 Even the scheduled power outage (due to building maintenance) couldn’t stop the Cre8tive YouTH*ink team from moving forward on their new mural. No problem: the crew simply got busy using the natural light streaming into the spacious Brooklyn loft at Industry City. 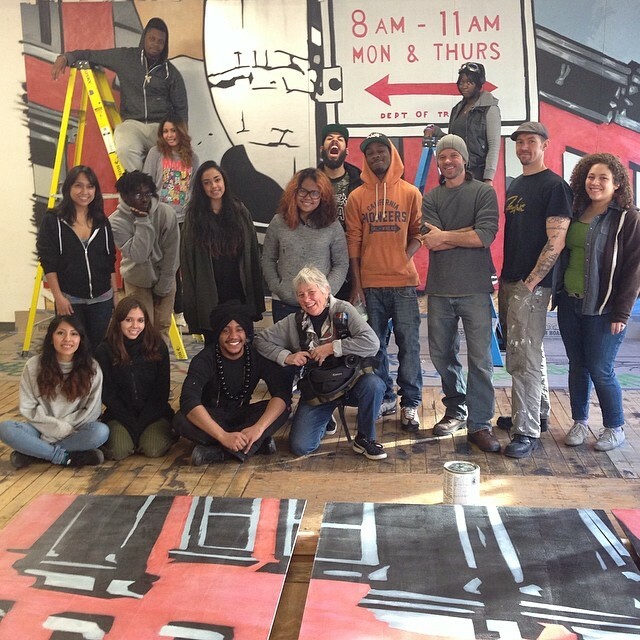 The legendary photographer Martha Cooper surprises the team with a visit to the to the studio. Rows of red, faux-brick panels with painted black and gray windows line the two long walls of the studio. 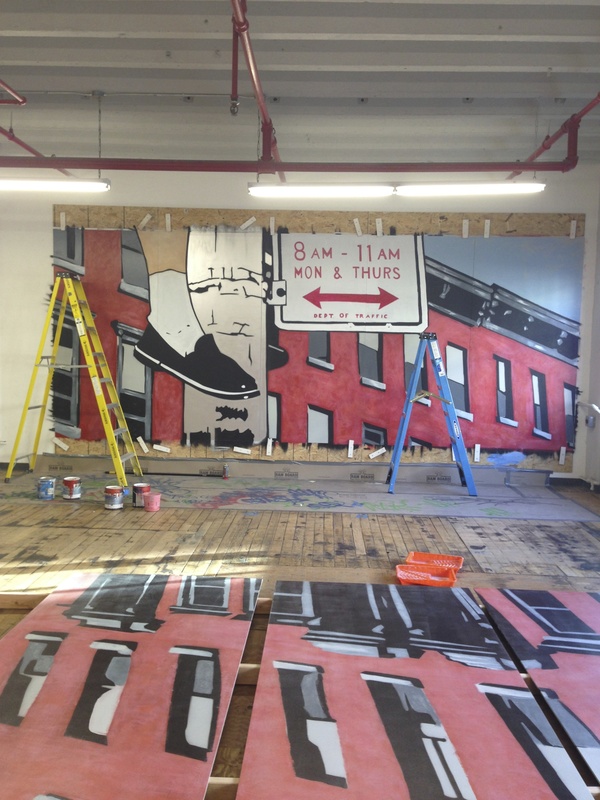 A giant foot, taking up more than a single 4-foot-by-8-foot panel, gives a good indication of just how monumental the “Sign Language” mural will be once assembled at its final home at 267 Pacific in Boerum Hill, Brooklyn in early spring. The scale of the “Sign Language” mural is massive! The panels in-progress are secured by an ingenious system of wooden slats, which are secured to the wall above and below the mural planks. Smaller pieces of wood are screwed into the boards so that they may rotate, holding the boards in place until they are finished and can be sent out to the construction crew that will put them up on the facade of the forthcoming building at 267 Pacific Avenue in Boerum Hill, Brooklyn. A smaller side studio holds the completed panels, which lay on a slightly raised grid-system. These panels dry in the sunny, warm afternoon, waiting for their final layer of Sherwin-Williams industrial/marine clear acrylic overcoat for added protection. This smaller studio also houses most of the team’s supplies, with tubs of paint, brushes, wooden planks, aerosol cans and other items lined on a large makeshift table. The team has spray-painted their names, tags, and various doodles onto these tables and the protective cardboard around the panels, giving the studio a lived-in feel. The team of apprentices hums with a familiarity that only comes from a group that has worked together before; indeed, some of the students have participated in all five of Mista Oh and Cre8tive YouTH*ink’s previous projects. From a ladder, apprentice Cynthia applies red daubs in a cross-hatch technique. 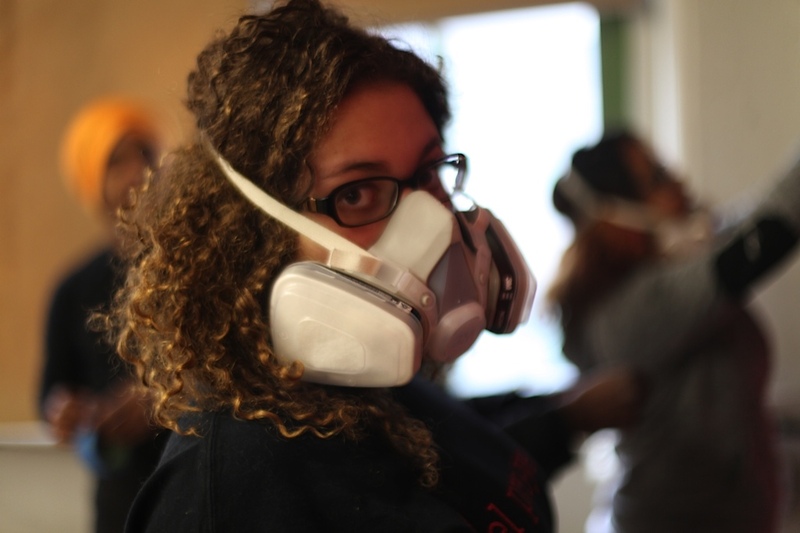 When she begins to run out of paint, crew chief Crystal is already on her way over with a new tray of paint. The two compare this new shade of red with the color already drying on the panel and decide to go with a darker hue, to give the brick more depth and texture. This is just one example of the confident communication and collaboration going on within this experienced team. On the other side of the room, Billy Mode talks with apprentices Alicia and Virginia, showing them one of his paintings. He discusses his use of stencils and how this technique can create mind-bending images. As fellow artists who have learned the art of stencils and spray cans directly from Mode himself, the team appreciates his work as equals. Like the team they lead, Billy Mode and Chris Stain have a seasoned intimacy because of their collaborative history and friendship. Sometimes it seems like they don’t need to communicate verbally at all, so in sync are they with the project’s goals and progress. When they walk around the side studio, looking at the painted panels ready for their final coat, they merely nod satisfactorily and slap each other on the back. Chris and Billy getting’ it done late into the night — readying the outlines for the next day’s work. 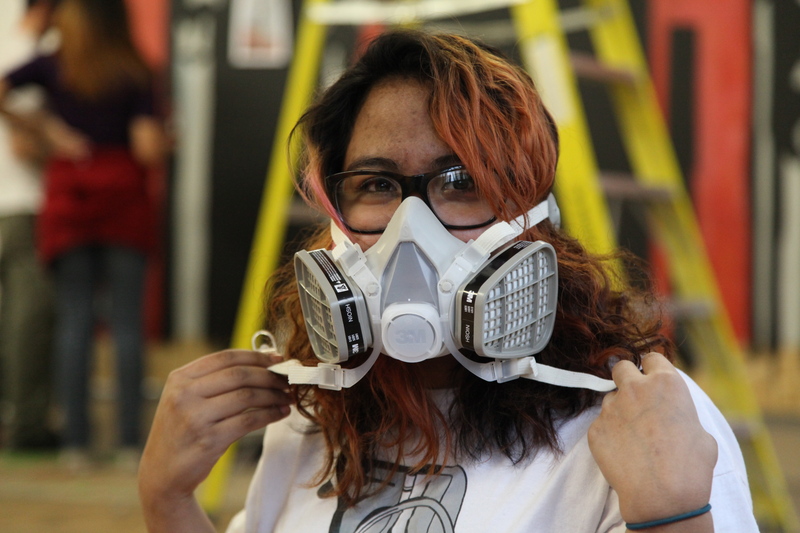 In addition to traditional latex painting methods, the apprentices have learned aerosol spray-can techniques and stenciling savvy. 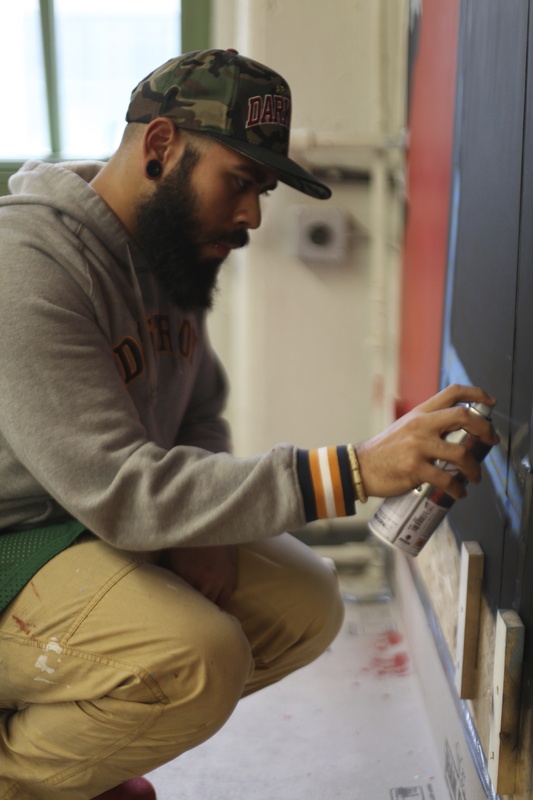 These new skillsets are undoubtedly expanding the apprentices’ creative horizons. Despite an emphasis on the physical, plastic craft of painting during the construction of the mural, photography remains an essential component of the project. 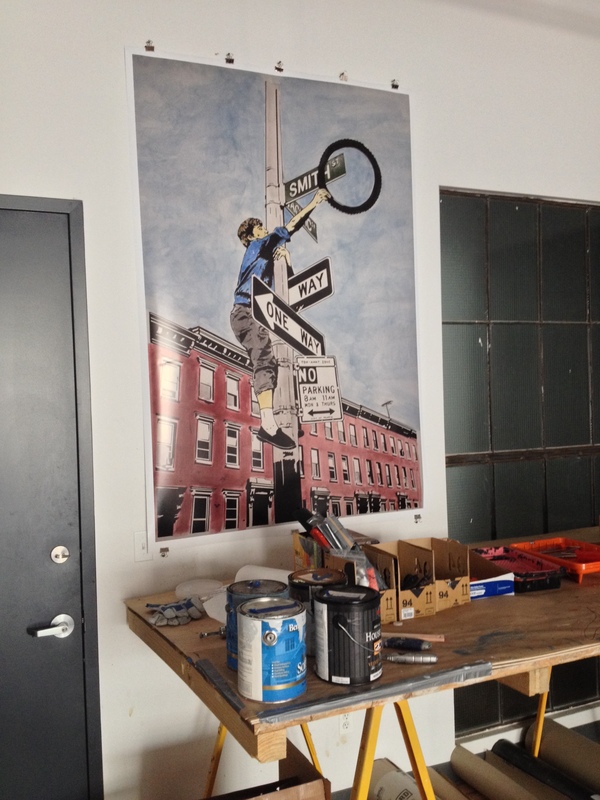 The picture of an inner city youth collecting bicycle parts, on which the mural is based, hangs in multiple locations around the studio for inspiration. Big-ups to photographer Andrew Moore for his gift of the large-scale prints the team uses for reference. 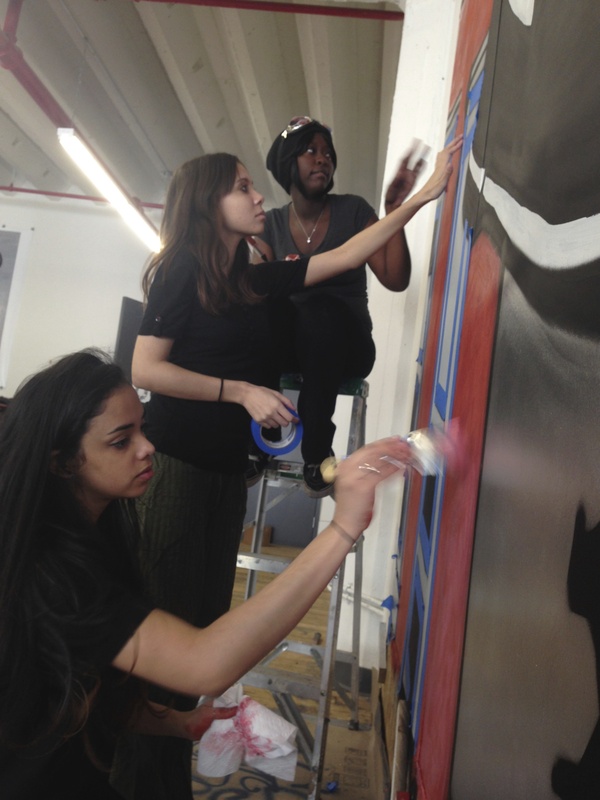 Indeed, the legendary Martha Cooper, whose iconic series “Street Play Project” includes the mural’s source photograph, has visited the studio as well. Chris Stain’s adaptation of “Street Play” Prints donated by Andrew Moore Photography. She, like Stain and Mode, slid naturally into the role of mentor, doling out photography tips to crew chief Crystal, who is documenting the project for a class. Cooper, who like Stain and Mode hail from Baltimore, applauded the apprentices on their vision and dedication to such a large undertaking. On Sunday, the first group of ten panels got their Sherwin-Williams clear coat to protect them against the elements, thereby completing the first set of mural panels. The boards secured to the walls got their finishing touches of paint, soon to be moved to the side studio to dry and receive their final coat. The new, blank planks will be projected upon and stenciled, then painted and sprayed. The cycle goes on; wash, rinse, repeat. Ten panels down, 80 or so to go.